Exactly one year ago today, the Conference of the States Parties in its 20th session decided on the establishment of the Advisory Board on Education and Outreach (ABEO) as a subsidiary body to the Organisation for the Prohibition of Chemical Weapons (OPCW). In 2016 the 15-member board met twice and formulated its first sets of recommendations. On 1 December I reported on the ABEO’s work to the 21st session of the Conference of the States Parties. Due to a 7-minute time restriction I could deliver only a summary of the most important points. Below is the full text of the statement as circulated to the states party to the Chemical Weapons Convention. At last year’s Conference of the States Parties you decided to establish the Advisory Board on Education and Outreach (ABEO) as one of the subsidiary bodies of the Organisation for the Prohibition of Chemical Weapons (OPCW). The ABEO received as mandate to advise the Director-General or States Parties on matters of education, outreach and awareness-raising, and public diplomacy concerning the Chemical Weapons Convention (CWC) and its international and domestic implementation in relation to States Parties and key stakeholder communities. Put differently, it seeks strategies to assist the OPCW with deepening the involvement of the stakeholder communities in preventing the re-emergence of chemical weapons. 4 persons from Western Europe and Other States: Belgium, Germany, the United kingdom and the United States. Two members—Prof WANG Wencai (China) and Dr Austin ALUOCH (Kenya)—are Alumni of the Associate Programme. One member, Prof. Alastair Hay (UK), is a recipient of the 2015 OPCW–The Hague Award. While the ABEO resulted from groundwork laid by the OPCW Scientific Advisory Board (SAB), ABEO membership includes not just chemists and other scientists, but also experts with backgrounds in the political sciences, history, diplomacy, as well as persons well versed with issues in chemical weapon disarmament, education and outreach strategies, or the functioning of National Authorities. In addition, and as a first for Advisory Boards, the ABEO can also benefit from the expertise of select observers. Observers are non-permanent and they are invited in function of the meeting agenda. However, the Rules of Procedure stipulate that a representative of the International Union for Pure and Applied Chemistry (IUPAC) is to participate in the ABEO’s work as a permanent observer. At their second meeting in October 2016, the Board Members decided to accord a similar status to a representative from the International Council of Chemical Associations (ICCA). In its first year of activity the ABEO has met twice, in April and October 2016. With the help from the Technical Secretariat an electronic discussion platform has been set up, so that Members can continue to discuss and develop recommendations in the so-called ‘intersessional period’. This electronic platform allows the setting up of sub-groups in which ABEO Members, as well as observers, can develop ideas and discuss working papers on topics decided at the preceding meeting. The goal is to have well-conceived proposals for final consideration and adoption by the full Board. Mr Chairperson, the first meeting (28–29 April 2016) focussed mainly on team building. Each member and observer presented an overview of their education and outreach activities, thereby highlighting objectives and describing their respective methodologies. The Board furthermore heard detailed briefings by Technical Secretariat staff members. Substantive work developed along two tracks, namely specific requests submitted to the Board by the Director-General requiring short-term replies, and identification of strategic-level, i.e., longer-term aspects of developing education and outreach methodologies. Strategic-level thinking implies a need for common understandings for key concepts and terms as well as identification of key stakeholder communities. 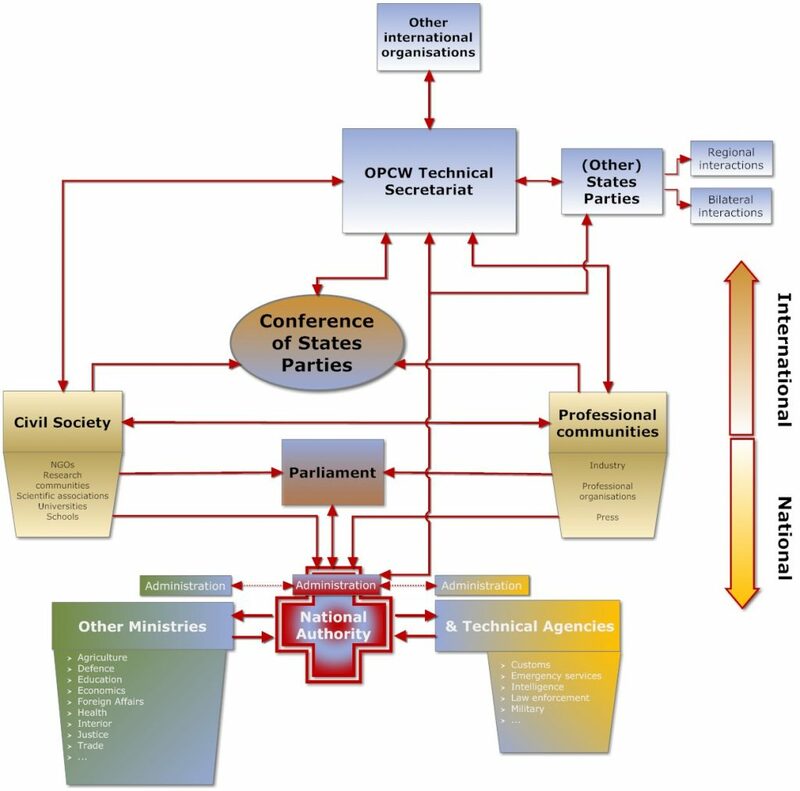 It also implies the identification, elaboration and prioritisation of issue areas, the development of multi- and cross-disciplinary approaches to education and outreach, and the permanent evaluation of tasks and activities in function of changing circumstances under which the OPCW must continue to function. The ABEO proceeded in its second meeting (4-6 October 2016) with identifying key stakeholder communities and plotting how they and the OPCW interact with each other. As the CWC effectuated a clear division of labour between the Technical Secretariat and the National Authorities it followed naturally that stakeholdership in the convention exists on both the international and national levels. From the exercise also followed the insight that certain stakeholder communities may be targets of the OPCW’s education and outreach activities, while they may be partners under different circumstances. The press is a case in point. A well-conceived public diplomacy strategy can clarify to journalists the CWC’s intricacies, the functioning of the OPCW and the tasks and responsibilities of the Technical Secretariat in its various missions. When the OPCW makes the headlines, the media will be better situated to reflect accurately the challenges and opportunities facing the community of States Parties. For its deliberations, the ABEO accepted working definitions for concepts such as education, outreach, training and public diplomacy. Such differentiation in turn enabled identification of primary strategies to be developed under each concept in function of the type of stakeholder community to be engaged. Moreover, it will also enable the ABEO to take into consideration different regional and local cultural approaches to education and outreach. The ABEO Members are agreed that no single methodology can fit all circumstances. to provide early notification to enable organisational planning of regional and local events; provide funds to initiate and support such regional and organisation; and create outreach material on the OPCW and the CWC, specific to the 20th Anniversary Year, for broad distribution. A global campaign condemning the use of the industrial toxic chemicals—chlorine in particular—as weapons led to many letters by chemical associations worldwide and increasingly by chemical industry associations being sent to the Director-General. The ABEO recommended that these letters be publicised on the OPCW website. It gives me great pleasure to note that this recommendation was implemented last Tuesday (29 November). The ABEO also recommended a thorough review and overhaul of the OPCW’s public diplomacy strategy in function of permanent, systematic engagement with stakeholder communities. Other recommendations addressed youth outreach and engagement of civil society during sessions of the Conference of the States Parties. Some elements are already being implemented, such as briefings on the workings of the Technical Secretariat to the members of the CWC Coalition attending the 21st Conference of the States Parties. Mr Chairperson, in preparation for its third meeting next March, an ABEO working group is considering in detail how to assist National Authorities with carrying out education and outreach activities. In particular it will seek to enhance regional coordination among National Authorities, encourage use of existing educational materials, and stimulate ideas for developing new ones. Online educational tools already developed by the Technical Secretariat will be assessed and recommendations for methodological harmonisation and other improvements submitted. A second working group is looking into ways to engage specific stakeholder communities, in particular scientific associations, industry, professional organisations and other expert communities. Primary themes to be developed include raising barriers against erosion of norm against chemical weapons and the CWC, means and ways of keeping those stakeholder communities informed and engaged in Convention-mandated activities, and engaging them in the further development of the treaty regime in light of the changing national or international environments in which the CWC must remain relevant. Other working groups of ABEO Members will consider recommendations on how to address immediate challenges to the CWC regime as part of a public diplomacy strategy, ways to engage with other international organisations in promoting peace and disarmament education. Work will also continue on ‘Longer-term strategies’, ‘Outreach at the regional, national and local levels’ and ‘Youth outreach’. Besides these activities ABEO Members have also actively participated in regional seminars for National Authorities organised by the Technical Secretariat. In my capacity as Chairperson I made presentations on opportunities for education and outreach in the Workshop on Article XI implementation and the Annual Meeting for National Authorities. Finally, the ABEO and the Scientific Advisory Board have established a working relationship and plan to collaborate and consult with each other in areas of common interest. Mr Chairperson, by way of conclusion I wish to thank on behalf of the Board Members all States Parties that have recognised the work of the ABEO in its first year and support its goal of promoting substantive interaction between the OPCW and its many stakeholder constituencies with a view of safeguarding the world from a re-emergence of chemical weapons. We are looking forward to your continuing endorsement, including in a more tangible form when we will set up a trust fund to support our projects and activities. And as a final reminder: you the States Parties can also request the ABEO’s advice on pertinent matters. I request that the full text of this statement be considered as an official document of the Conference and published on the OPCW public website.